The CX6 CNC coax cable bending machine is built to bend semi-rigid coax cable. Production ready, with or without as a manual saw, this bench top, all electric coax bender, is microprocessor controlled. A keypad and display are standard and provide an easy way for the user to program a cable quickly. This coax cable bender comes standard as a single radius CNC bender. The CX6 can bend semi-rigid or flexible coax with or without connectors. The CX6 bends semi-rigid cable using a rotary wipe process. This technique has proven to be most gentle on the semi-rigid cable itself providing for excellent signal transmission. The collet closer that holds the coax during the bending process is designed specifically to grip yet be gentle on the cable’s outside jacket keeping the SWR in line. The design of the carriage spindle allows the end of the coax cable to get right up next to the bend tooling on the very last bend. This often translates into avoiding a trimming operation after bending. Software features include hitch feed, interference checking, and speed control of the L, R, and A axes. A Windows PC interface is used to convert from XYZ data points to LRA bender data. The PC interface also makes it easier to change the LRA bender data with ease. Also, the PC inteface works in inches or millimeters. An optional STEP file converter allows a user to read in a CAD generated STEP file direct from CAD right into the bender’s controller. No need to type in the cable’s bend data standing at the CX6 cable bender, go ahead and read in the 3 dimensional bend data direct from your CAD system. It’s that simple. The CX6 is fast, accurate and repeatable. Designed and built in the US, this coax cable bender is production ready. Give us a call with your application. We are here to help. All coax bending machines are designed and tested in house. We use standard purchased components to build every coax bending machine. We at Winton are proud of the quality of every coax bender sold. Please, call us today and ask how the quality of the bending machines we build will translate into quality bent coaxial parts on your shop floor. 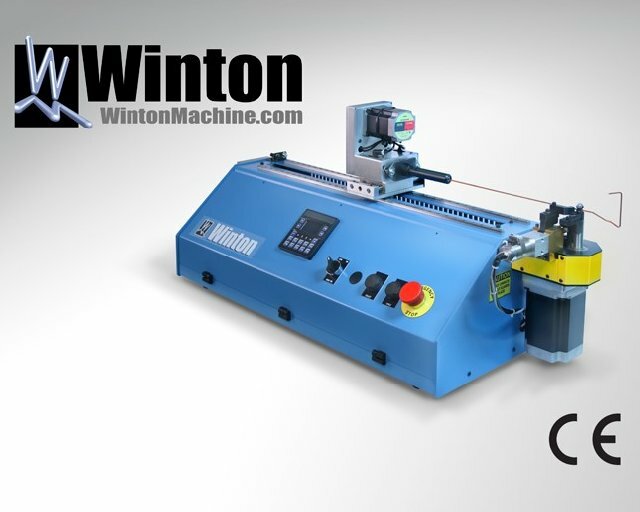 The CX6 CNC coax cable bending machine is built to bend semi-rigid coax cable. Production ready, with or without as a manual saw, this bench top, all electric coax bender, is microprocessor controlled. A keypad and display are standard and provide an easy way for the user to program a cable quickly. This coax cable bender comes standard as a single radius CNC bender. The CX6 can bend semi-rigid or flexible coax with or without connectors. 21399-503-CX6 from Winton Machine on Vimeo.